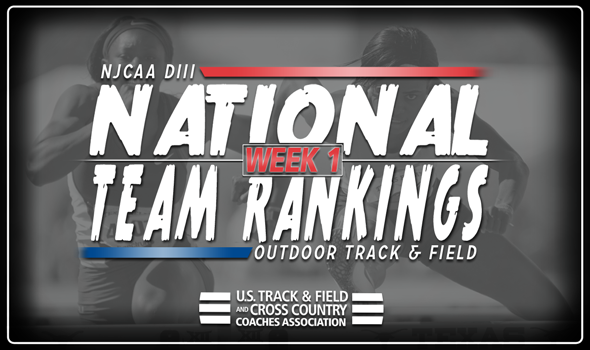 NEW ORLEANS – Rowan-Gloucester (N.J.) CC sits atop both the men’s and women’s rankings in the first week of NJCAA Division III Outdoor Track & Field National Team Rankings, announced the U.S. Track & Field and Cross Country Coaches Association (USTFCCCA) on Wednesday. The Roadrunners have had an excellent season to this point, giving them a solid cushion in the rankings. The men are looking for its first outdoor national title since 2014, while the women haven’t claimed one since 2013. While they are certainly poised to do so out of the gate, they will have their work cut out for them this season. The NJCAA Division III Outdoor Track & Field National Championships will be held on May 10-12 in Utica, New York. The Roadrunners already own 28 top-10 NJCAA Division III Descending Order List marks this season. The squad is led by Joshua Legg, who owns the top time in the 110 and 400 hurdles, as well as Mike Dowd in the steeplechase and Adam Hunt in the discus, both of whom own the top marks in NJCAA Division III. After finishing second a year ago, Rowan-Gloucester (N.J.) CC has its sights set on a title this year. Standing in its way is the defending champion, Kingsborough (N.Y.) CC. The Wave certainly take care of business on the track, as the program has 18 top-10 NJCAA Division III Descending Order List marks this year all in track events. The 4×100 and 4×400 relay teams lead NJCAA Division III this year, as does Paul Chillo in the 1500, Humberto Wallace in the 800 and Theodore Westcarr in the 200. Rounding out the top-five is Harper (Ill.), Triton (Ill.) and Suffolk County (N.Y.) CC. The ranking for Triton (Ill.) is the highest in program history after ranking 10th across two weeks a season ago. The women Roadrunners are just like the men’s program: dominant. A total of 24 top-10 NJCAA Division III Descending Order List marks are owned by Rowan-Gloucester (N.J.) CC. Of those 24, Jordan Austin (400 hurdles), Azia Pitt (high jump) and Elisia Lancaster (shot put and hammer throw) sit atop the Descending Order List in their respective events. Harper (Ill.) is ranked second after a runner-up finish a season ago. The Hawks have three fewer top-10 NJCAA Division III Descending Order List marks than the Roadrunners, but the program has a stranglehold on the 1500. Misbah Baig leads the nation in the event, and the Hawks have the top-six runners in the event on the season. Natalie Cook (800) and Breanna Bogucki (5000) also sit in first in their events.